Coverage: Live on S4C, live radio commentary on Radio 5 live sports extra, BBC Radio Wales, BBC Radio Cymru & BBC Sport website and BBC Sport app, plus live text commentary. Wales coach Warren Gatland wants his Six Nations scrum-half Gareth Davies to talk on the field as much as Rhys Webb. Ospreys' Webb was Wales' first choice in the position before a foot injury wrecked his 2015 World Cup hopes. Webb, 27, has returned for Ospreys and hopes to play in the championship. Gatland praised the ability of Scarlets' Davies, who has scored six tries in 12 Tests, to "create something out of nothing", but added: "We want him to be more vocal." The New Zealander also wants the other number nines in the squad - Cardiff Blues' Lloyd Williams, 26, and uncapped Scarlet Aled Davies, 24 - can all improve their communication. "With our nines that we've got in the squad at the moment, that's one aspect that they need to keep working on. "A real thing about Rhys Webb is that he does talk a lot and communicates really well with the forwards. That's the aspect of Gareth's game he does need to work on." 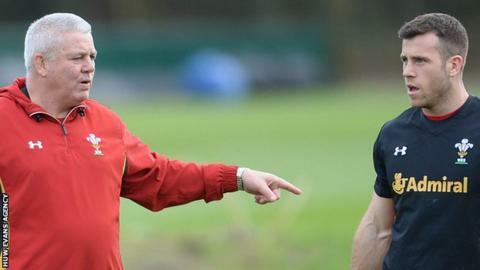 Gatland said Davies made good decisions in defence in the win over France that kept alive Wales' title hopes. The 25-year-old made a searing first-half break against France, creating a four-on-one overlap only to kick ahead, clearly frustrating full-back Liam Williams, who felt his fellow Scarlet could have passed instead. Webb lasted 72 minutes of Ospreys' 30-22 Pro12 defeat at Connacht on Saturday, his first start after recovering from foot surgery. Gatland said he would "see how he goes" before considering him for a Six Nations call-up. If Wales win against England at Twickenham on Saturday, 12 March they would be favourites to win the title a week later when Italy travel to Cardiff.